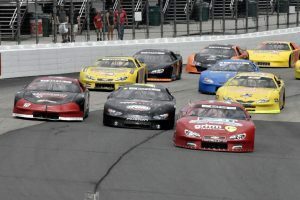 WALPOLE, N.H. – The Granite State Pro Stock Series season will end in style on Saturday evening at Connecticut’s New London-Waterford Speedbowl. With one of the largest car counts of the season expected, the 2017 series champion will be crowned in the season-finale. The 2017 season has seen 10 different drivers visit Victory Lane in the first 11 races, including Derek Ramstrom, who stormed onto the scene in the second half of last week’s race at Thompson Speedway Motorsports Park en route to the victory. The only driver who has two victories in GSPSS competition so far this season is Joe Squeglia, who will be back at the Speedbowl. Heading into the season-finale, the championship chase is tight at the top. Former series champion Mike O’Sullivan holds a scant four-point edge on Rookie of the Year contender Scott MacMichael. Both drivers were involved in a crash at Thompson, but MacMichael was able to finish on the lead lap. By finishing ahead of O’Sullivan, MacMichael closed the gap from 14 points down to just four entering the finale. PLACE: New London-Waterford Speedbowl, Waterford, Conn.
Oddly enough, both of the top contenders in the championship have little experience at New London-Waterford, which could create a close battle right to the finish. Barry Gray enters the race third in the standings — 41 points out — as his hopes of becoming a champion for the second straight year start to slip away. Nick Lascuola and Cory Casagrande are currently fourth and fifth in the standings. Although all eyes will be on the battle for the 2017 championship, the season-finale will surely produce one of the highest car counts of the season as well. Multiple outsiders will join the series regulars for the 100-lap main event. Names like Bobby Pelland, Bobby Timmons, Tommy O’Sullivan, Angelo Belsito and Corey Bubar are part of the stout entry list. Defending New London-Waterford winner Dave Farrington is also entered, along with NASCAR Whelen Modified Tour regular Ronnie Silk. Other entries include Rusty Poland, Kevin Folan, Devin O’Connell, Nick Lascuola, Jimmy Renfrew and Chris Turbush and many more. This event to close the season is a one-day show for the Granite State Pro Stock Series. The pit gates open on Saturday morning at 8 a.m. for the haulers to enter the track. The series will have a 45-minute practice session at 11 a.m., followed by a 15-minute scuff session later in the day. Heat racing begins at 2 p.m., with the GSPSS one of the final divisions to hit the track for qualifying. The feature is the eighth in the order on Saturday and those features are scheduled to get underway around 5 p.m.
For more information on the Granite State Pro Stock Series, including the latest updates, fans are encouraged to visit the Facebook page or follow the series on Twitter, @GSProStocks. You can also visit us on the web at www.gspss.net.